I just bought my first box of saltines since 2010. These crackers are fit for all manners of cheese, particularly those deli slices of colby or colby jack. They are also fit for my off-brand peanut butter. And if I am having a bland day, I’ll eat them plain. They are, in short, the ideal snack food because of their versatility. They don’t taste like anything and can therefore be topped to the choosing of the consumer, or else devoured naked in times of duress to satisfy a salt craving. But they are not fit for my soup. Imagine, if you will, building a house (or any sort of structure, which, for the record, you don’t want my help with. I will make your construction gents lemonade and feed them with whatever I have on hand, but if you give me a hammer, I will somehow manage to lodge it in the concrete foundation or get it stuck in the PCP pipe… never mind how. I will manage. Trust me.). Now, a house is a very personal thing because it needs decorated and furnished with lots of stuff that speaks about who you are. You put stuff in it. Make it your own. Hang pictures on the walls. Throw area rugs on the floor. I’ve seen this happen with soup: some people delicately dip their crackers as they do biscuits (re: cookies) into tea. Others feel more destructive and crush the offending wafers to a fine powder, then sprinkle their remains into the bowl like the ashes of a cremated fisherman. As for me, I’m a dipper, and if I get oyster crackers, I will eat them prior to taking the first bite of the soup. Returning to my point: say you’re at a diner and you order a bowl of soup. It looks a little like Progresso. This calls for some crackers, as they are the closest thing to pleasant texture you are guaranteed to get out of that bowl. Say you’re in Mount Pleasant at The Brass Café, and you order your nine dollar sandwich with soup (which you always should at The Brass). You order the three bean (you’ve already had the chicken and rice once before, and it was good, but you’re looking for something a little different). It comes out. It’s tomato based and spicy enough to make your nose run a marathon but not spicy enough for you to lose IQ points by continuing to eat it. Aside from cooling your mouth with the water you ordered, you cut the flavor’s intensity with the crackers. Joy and bliss ensue as you finish the soup. It’s nice soup, and you don’t really have any alternatives for dipping because you bought it from someone else. Similarly, when you buy a house, you don’t have much choice of what’s already in it, but you can change it once it belongs to you. Just so with my soup. I spend a good, hard hour and a half in the kitchen manufacturing the Monticello of soups (I wouldn’t compare it to the Sydney Opera House or Frank Lloyd Wright’s stuff, but in terms of quality, it’s decent enough to be a Monticello), cutting vegetables into uniform chunks and turning my little slice of heaven into the Tower of London by torturing myself half to death with the smell of it cooking. The last thing I want to do is default to painting all of the walls white and buying my furniture from WalMart (unless your wallet necessitates it, which, if you’re building the Monticello, I doubt you are in poverty). I don’t cook anything I don’t like, and I happen to enjoy my soup quite a bit. In fact, it’s probably my favorite thing to eat. So, if I’m spending that much time on my soup and plan to dunk something in it, why not make it something worthwhile? Generally, I think soup is fine as it is and doesn’t need any help, especially if I’m in control of everything that goes into it. In week 2, I bought a nice bakery loaf of multi-grain bread to go with my chicken broccoli-cheddar soup. 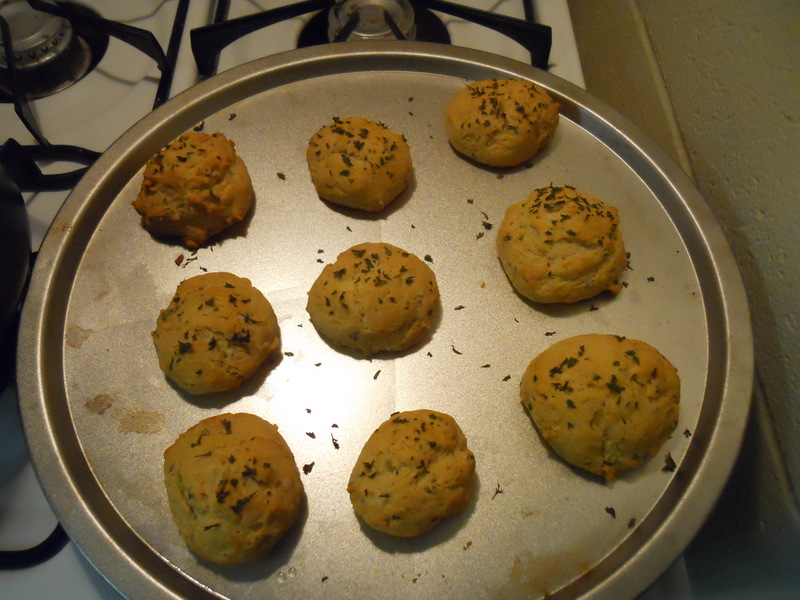 This week, just before going to work on my chipotle chicken chowder, I decided that something delicious needed to go in there, and what better than some garlic-cheddar biscuits? They’re the only reason I ever want to go to Red Lobster and Ruby Tuesday’s (I’m still weary of fish, and while Ruby Tuesday’s has a decent salad bar, I personally think that Bennigan’s has better burgers), and if I had know they were so easy to make, I would never have had a reason to set foot in either establishment in the first place (if not for Ruby Tuesday’s Salad bar, that is). Although I don’t trust in skinny chefs, I do believe in eating healthy, so I’ve altered a recipe I found online to omit the butter (gasp), and they turned out fine. The world did not careen off of its axis or anything drastic like that, and I didn’t miss the butter flavor once I sopped these in chowder stock. I would call them Monticello windows, but that’s carrying the metaphor too far, don’t you think? In bowl, mix flour, baking soda, baking powder, salt, sugar, 2 tsp. parsley flakes, and garlic powder. Add oil and milk. Mix thoroughly with a fork. On a baking sheet, spoon dough. Top with olive oil and remaining parsley and pat down lightly. Yields 9-10 biscuits, just enough for me to perform quality control.